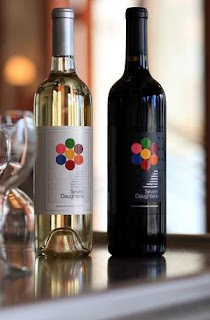 Seven Daughters Red Winemaker’s Blend is a sophisticated mélange of Syrah, Merlot, Zinfandel, Carignane, Sangiovese, Cabernet Franc and Cabernet Sauvignon. The bouquet displays blackberry and pepper, supported by subtle notes of lavender and vanilla. After an exuberant palate of red fruit, including dried cherries, the wine finishes with a touch of spice. Typically I don't agree with the winemakers descriptions. Fruity whites usually are on par with their descriptions but when I read the bottle or accompanying descriptions of reds I find my un-sophisticated palate doesn't find the fruity hints or subtle flavors of vanilla or almond or berries they boast. I'm not a big fan of merlots because of this fact coupled with the mouth-drying factor as well as frequent headaches I get from them. This one... is different. Happily different. Seven Daughters Red is a blend of 7 different wines. Grown in sun-drenched Napa and Sonoma Valley, the balance of the warm California sun, coupled with the regions’ characteristically cooler evening temperatures, ensures a slow but steady ripening of the fruit, a deep berry fruit flavor, spicy nuances, mature tannins, and vivid color. Color was the first thing I noticed. Brilliant. Gorgeous. My husband and I shared this bottle of wine last weekend on a short get-away to a cabin on the lake. As I poured our glasses I remarked on the beautiful color... not dark like a typical merlot but a shimmering ruby red reminiscent of a gem. I inhaled the aroma and caught the fruity overtones and a vanilla undertone. This was a good sign! Since we were camping we would have paired the wine with whatever we happened to have been eating at the time but I was infact making lasagna for dinner and this wine went beautifully with the pasta dish. Later we enjoyed sipping it alone as we finished it off, and it was excellent to share on its own. Lighter than typical reds it was a perfect blend of reds and merlots. I give it a thumbs up and report that I did not get an 'after red' headache that evening. Bouquet: Vibrant aromatics offer several pleasant surprises of blackberry upfront, with lavender and vanilla following suit. Palate: Smooth and intriguing wine shows exuberant fruit flavors opening with succulent red fruit ranging from blackberries and dried cherries. The presence of Syrah complements the wine with a closing note of peppery spice, for a memorable finish. Pairings: Interesting on its own or with light pasta and red sauce, grilled poultry or beef dishes.